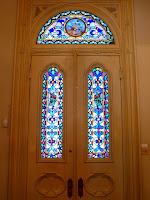 My place: 67, Front Door, part 1. Building my bluestone home in Southern Victoria, Australia. I have been building my stone house in Bellbrae, Southern Victoria, Australia, since 1994. It is a Victorian style Bluestone/Limestone construction. Being new to blogging I will progressively upload both backdated and current pictures and blogs. Geoff Winkler. it is well worth looking at. 67, Front Door, part 1. Now that most of the "holes" in the walls had been plugged, I was now able to divert my attention to the the big opening, in the front, for the main entrance. This, I wanted to be "special" and had, for some time, been scouring my photo collection and the Internet, as well as taking every opportunity to ply the streets in search of inspiration and suitable examples. The most favoured of all the designs that I came across belonged to "Foynes" and "Eastcourt", A pair of extremely beautiful houses located on the hill, on Powlett Street, East Melbourne. This pair of adjacent dwellings were built during the late 1880's, the construction of both being overseen by the same architects. This is the impressive entrance to "Eastcourt", (which, at this time is undergoing some restoration work, hence the scaffolding). It has a lovely 'storybook' feel to it and had me captivated with the delicacy of the detailing. With this design though, a major concern for me, at my location, is the space between the twin columns. The local mud wasps would have this void filled within the first couple of weeks of their nesting season, not to mention the continuous "buzzing" as they incessantly achieve this!. The gaps between the Dentils could also present a problem in this regard, but they would be easier to clean out and omitting this feature from the design would seriously detract from the finished product. Also of concern is the waist height Cornice on the tops of the Pedestals, although aesthetically pleasing, it protrudes into the door opening at least 3inches and, in practice, may lead to unwanted injuries. The one on the right hand, opening side, showed signs of impact. The entrance on "Foynes" is much more austere, but the single columns tend to give it a more "grander" look. 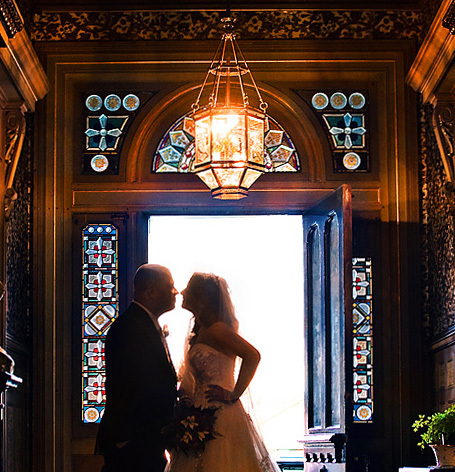 I felt that I would be able to marry together, my favourite elements from both of these doorways. With the design for the frame settled on, I was then able to sit down and prepare some working drawings. On my place, the opening dimensions of 1750mm wide by 2935mm in height, which I had allowed for, between the stonework, scaled down to very close to 10% smaller than both of these examples. 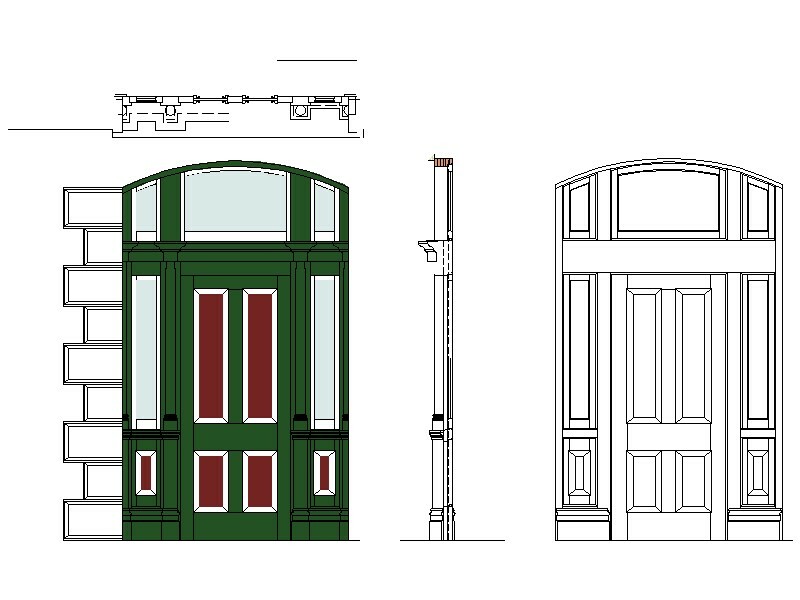 This worked out quite well, with the original doors, being approximately 2300mm high, it suited a standard door height for me of 2040mm. The entire frame was to be made using Celery Top Pine, mainly all the 1.5" thick stuff, set aside while preparing the frames for the windows. First up for the physical part was to sort through all the left over shorts and bandsaw enough of them, to a suitable curvature for laminating together to form the segmental arch head. To ensure that I maintained the correct profile, I formed this in stages. I glued and clamped the first four lamination's, as in the above photo, which I allowed to fully harden before building up the remainder. When complete I cleaned the dust and cobwebs from the compass I had knocked up when making the frames for the back door, seen here; Joinery-part-one. With the router mounted, I then trued up the piece, rebated it for the sashes and formed a beading on the inside arris. With the head taken care of, the vertical components were then laminated up. The sticks I had, at close to 2.7m in length, were just barely long enough for the Stiles. 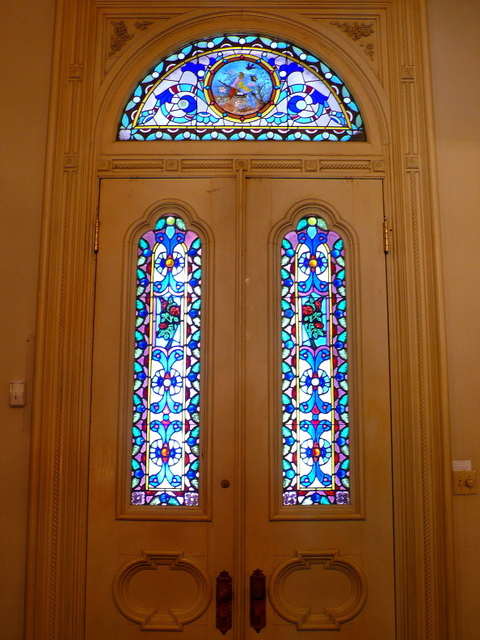 The Mullions, though, were longer, so I joined them where they will be rebated at Transom height on the inside face and near the base on the outside, where most of it will be hidden behind the Pedestal. The next major component for the frame to be done was the Transom rail. With overall finished dimensions of 286mm high x 68mm thick, (excluding all the cornices etc. ), this chewed up a fair bit of wood and was laminated in 2 stages. Firstly, the wide sections were joined, before being planed flat and then the two halves were sandwiched together. Once complete, the rebates were formed, arris beading's routed and the lower outside face was moulded. 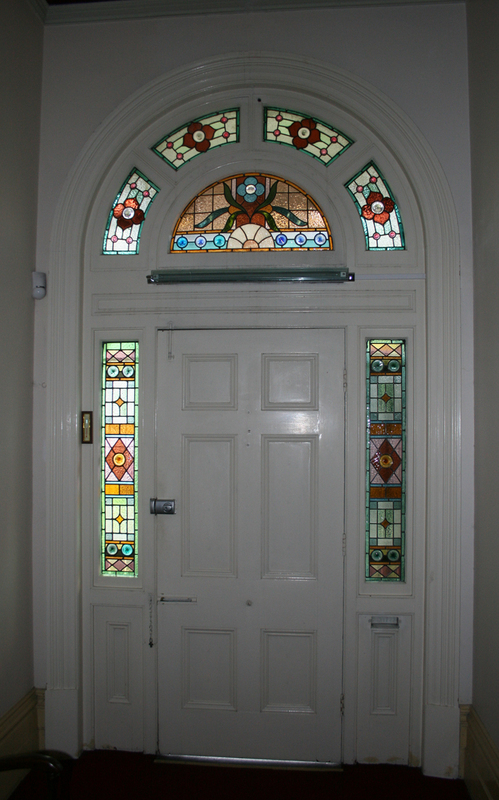 The inside face of the Transom is quite broad, much wider than that which is usually found on Victorian entrances. The central glueline also detracted from the overall appearance and it was quite obvious that some form of embellishment would be needed. Unfortunately, following many repeated and futile attempts to gain access to either Eastcourt or Foynes, I have not been able to view or photograph the interior joinery. 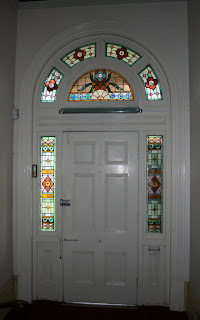 The former almost appears to be uninhabited, with no responses to repeated door knockings or letters, (although a dog was heard barking inside on one occasion! ), and with the latter, ingress has been denied by a very uncooperative resident!. 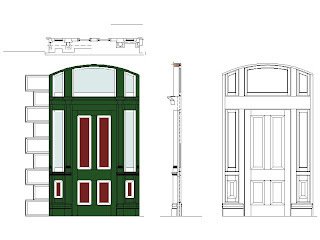 On the up side, I have been able to locate and view a few other examples of deep Transom rails around Melbourne. This entry, in North Brighton, had decorative rebates carved into the sold panel. I very much liked the idea, which gave it very nice, individual "hand made" look. This would not be ideal for mine though, as the glue line would still be very obvious. 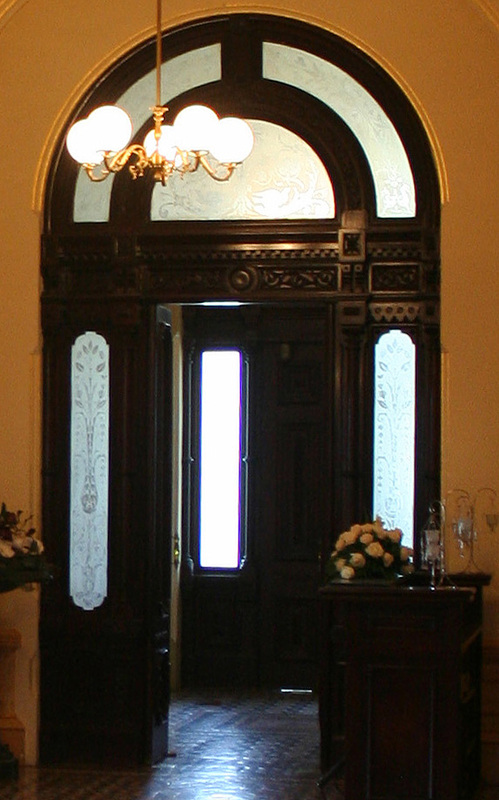 Doors on the Presbytery at St.Monica's in Footscray, (above), and at Flinders St. station, (below), had recessed panels, fitted with insert mouldings. At this stage this is probably the style which I will adopt. I will leave the machining of this until as late as possible, should an alternative become apparent. and this example, which was being sold on Ebay, which has a simple 'Cricket bat' shaped piece applied.